When we started dating, I graduated from single-girl store-bought plastic tub to honeymoon dating phase homemade hummus. That’s what you do, you know. You shower every morning. You wear full-face makeup during the day. You cook dinner that has all five food groups over three courses while wearing an actual, cute outfit. You make hummus from scratch with garbanzo beans that you soaked and cooked yourself. The honeymoon, however, doesn’t last forever. In fact, I think it normally lasts for about nine months, less if you move in together within six. And two years and five months later on a Tuesday night after you’ve asked each other 18 times each “What do you want to do for dinner?” hoping the other will offer to throw together a farmers market’s worth of fresh produce for a salad, roll out pasta by hand and roast a free-range chicken to no avail, the two of you will actually find yourselves in yesterday’s pajamas and board shorts, hunched over the kitchen island across from each other at 10 PM, taking turns scooping hummus from a plastic tub with the only things you had in the fridge, leftover radishes and love. Eventually you two will find your way. He’ll take you somewhere you’ve never been for date night. You’ll re-discover that cookbook, the one that you both raved about on your second date. And even if you do eat hummus for dinner, it’ll be out of a bowl. These are all the ingredients that go into making hummus from scratch. 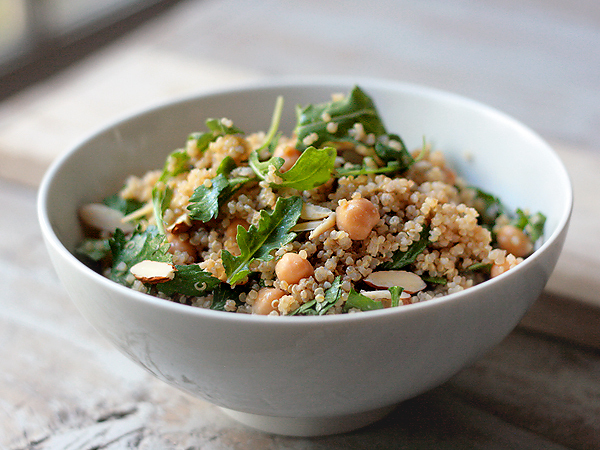 Garlic, tahini, lemon juice, parsley, and of course, chickpeas. Kept whole rather than pureed together in food processor, and tossed with quinoa, this makes eating hummus for dinner not as “just eating hummus for dinner”-y. 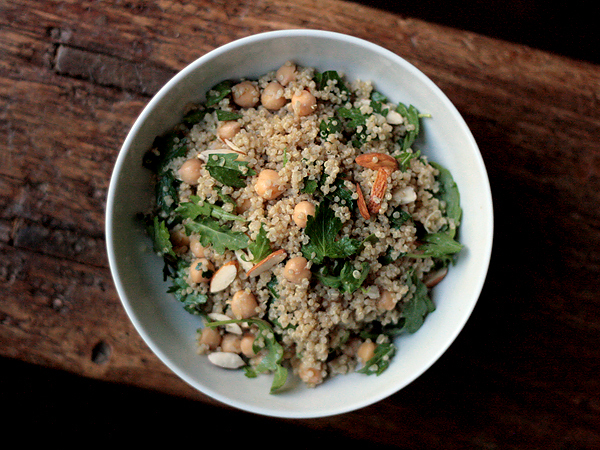 The quinoa is awesome, but it is the Tahini Lemon Vinaigrette that is the greatest thing I’ve discovered this summer. Tahini Lemon Vinaigrette (along with a few other tahini based dishes) finally makes it okay to buy that whole jar of tahini that seemed way too expensive when you only needed two tablespoons for the one batch of homemade hummus you ever make. In a small bowl, whisk together the tahini and lemon juice. The mixture will thicken. Stir in minced garlic and 2 tablespoons water to start. Add more water to thin the vinaigrette to your preferred consistency. Season to taste with salt and pepper. 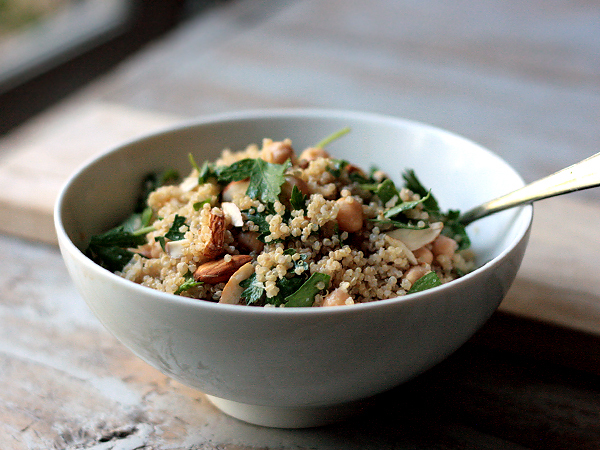 Toss the cooked quinoa, garbanzo beans, parsley leaves, arugula, and almonds in a large bowl. Drizzle with about half of the Tahini Lemon Vinaigrette and toss. Taste, and add more vinaigrette, salt and/or pepper if needed.